When you’re a historian specializing in early modern European history, it’s not often that your area of expertise is relevant to modern politics—and when it is, the situation is rarely good. 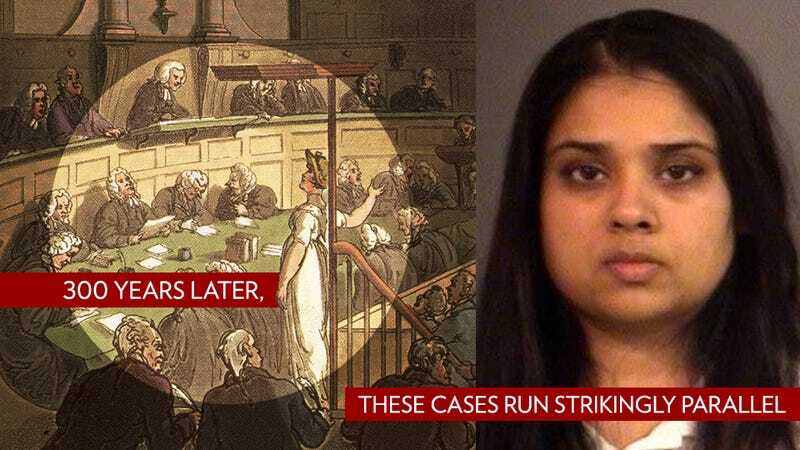 This past February, a woman from Indiana named Purvi Patel was found guilty of both feticide and child neglect after having what she claims is a miscarriage, and disposing of her stillborn child’s body in a dumpster. Recently, she was sentenced to twenty years in prison. This case has provoked widespread outrage and criticism, for good reason—not the least of which is that feticide and child neglect are contradictory charges. What struck me was that the adjudication of Patel’s case is alarmingly reminiscent of policies and procedures that were ostensibly made obsolete centuries ago. Let’s compare Patel’s case to one from the 17th century: the infanticide trial of 21-year-old Anna Barbara Hauin. The young woman’s ordeal began in 1692, in the bustling town of Augsburg in southern Germany, when a dead infant was discovered in a privy. When the baby was traced to Hauin, she was charged with infanticide and brought to court. So there is, therefore, no more believable reason, than that the same mother through malicious forethought, intended, through the killing of her innocent child, of which she is guilty either during or after the birth, in order to keep hidden her practiced depravity. If you were an unmarried woman in this era of religious reformation and conflict, you were in “practiced depravity” territory as soon as you became pregnant. Hauin, unmarried, would have had very few options once she found out the news. At the time of her arrest, Hauin was working as a maid in the house of a silversmith: a typical life for a young woman from the lower classes. Bearing the child could cause her to lose any chance at this legitimate work, and would certainly force her to face severe social recriminations. At worst, too, an illegitimate child could result in lifelong banishment from her community, with little to no hope of returning to a stable life. The child would also surely face a difficult future: Illegitimacy often barred one from any sort of honorable trade or membership in a guild. These prospects frequently led women who found themselves pregnant out of wedlock to attempt abortion—a dangerous prospect for the mother in a time when no safe methods existed. Other women became so desperate that, aided by the high waists and multiple layers of the period’s fashions, they hid their pregnancies and gave birth alone and in secret. They’d often attempt to dispose of their newborn infant without anyone noticing, and those infants would often end up in rivers and canals, in the woods, and even privies and trash heaps. But inevitably, pregnancies, childbirth, and actual newborn infants proved difficult to conceal. If a woman were found guilty of feticide (abortion) or infanticide in this period, she could very well be sentenced to death. Abandoning an infant, even at a foundling house, was likewise illegal and could itself result in severe recrimination. In other words, the stakes were extraordinarily high no matter which path the pregnant woman chose; once an unmarried woman became pregnant, there was no safe option available. Eventually, authorities began assuming that all unmarried pregnant women would inevitably try to commit abortion or infanticide. Some localities even made concealing a pregnancy itself a crime—knowing that some sort of criminal activity was the likely recourse. Unmarried women were in many places required to report pregnancies to an authority figure—sometimes a midwife, sometimes a town official. That way, if the child died or the woman miscarried, she would not be immediately presumed guilty. The other end of this logic proved very dangerous for unmarried women, who rarely reported pregnancies out of fear of social consequences. If the corpse of a fetus or infant was connected to an unmarried woman, it was assumed that she had killed it: courts rarely, if ever, considered the possibility of natural death. So when Hauin was labeled as the mother of the dead newborn, she was legally presumed to have committed infanticide. During the course of her trial, which lasted over two months, Hauin was brought in front of the town council, with no defender. In front of an executioner and a judge, she was interrogated repeatedly to establish the case’s details and force her to confess. She was threatened with torture and then, eventually, subjected to questioning while stretched out on the rack: one of the most severe methods of torture used in the period. Through the obscuring veil of leading questions, the interrogators’ assumptions, and the use of torture, it is possible to glimpse traces of Hauin’s story. She claimed to be unsure she was pregnant—not unusual at the time—and asserted that she had not expected labor to begin so early even if she had been. The baby, fallen into the privy, was already dead by the time she realized she had actually given birth. Knowing the fate she could face, she might reasonably have chosen to leave the corpse where it lay and just hope it was not found. This deduction proved crucial to Hauin’s case. According to the leading forensic science of the day, the lung test was the best way to determine if a baby had survived childbirth. It was based upon the concept that a baby who lived after birth would have breathed and taken air into its lungs: if the lungs floated in water, the child had lived after birth; if not, then the corpse belonged to a fetus which had died in the womb and had been stillborn. Of course, lungs that sank did not exonerate the mother, just turned the court’s attention from infanticide to abortion. The lung test also in any case could not determine whether there had been any sort of “foul play” involved in the death of the fetus or infant, but the court’s mind was generally made up on that point. Having confessed to infanticide, she was sentenced to death. On July 31, 1692, Anna Barbara Hauin was beheaded in the town square. She was one of about 100 women in Augsburg (a medium-sized city at the time, with population of about 30,000) who would be accused of infanticide between 1500 and 1800. About half of those women were executed; the rest were banished. Even outside of historical context, there are many obvious problems with Patel’s guilty verdict for two conflicting crimes, and her subsequent prison sentence. But the historical context is nonetheless chilling. Over 300 years have passed since Hauin’s execution, and save for the sentencing, their cases run strikingly parallel. Both women became pregnant out of wedlock, a phrase that for many these days is antiquated and obsolete. However, both women were likely held to a different standard because of their marital status. Hauin would have faced no suspicion had she been married—it’s arguable that Patel would have faced less suspicion if she had, too. Likewise, both women were outsiders in some ways in their societies: Hauin was poor, a servant, and thus granted few protections. Patel is an ethnic and religious minority. Both women seem to have gone into labor earlier than expected; both reported being taken by surprise by it, nowhere near medical facilities or anyone who might help. In both cases, the newborn died after a short window in which the mother was likely in great pain and perhaps even greater confusion and disorientation. Both women were also condemned by forensics, leading us to one of the more striking similarities between the two cases: The exact same lung test was used on Patel’s child as was used on Hauin’s. And in both cases, the baby was found to have been born living, and to have died very shortly thereafter, potentially placing culpability on the mothers for deaths that they did not necessarily cause. It’s especially shocking that the lung test was used in Indiana, considering that it fell into question over 200 years ago, not long after Hauin’s death. Beginning in the mid-18th century, advanced medical examiners (such as Peter Camper, Gottfried Wilhelm Ploucquet, and Wilhelm Bucholtz) had already identified flaws in the procedure. It became widely recognized that the lung test could result in both false negatives and false positives. And even then, physicians acknowledged that actions taken by the mother to save the child, or even the slightest decomposition of the lung tissue, could result in inaccuracies in the lung test. In a heartbreaking taped statement to detectives, Patel said that she had “tried to resuscitate” the fetus. And, in the end, Patel and Hauin in the end were both found guilty of their child’s death. It saddens me to be so harshly reminded that in many ways law and society have not moved beyond the 17th century. We still lay blame unevenly, and unfairly, on unwed mothers. In many places, we still do not provide adequate recourse or resources for pregnant women. And we still, apparently, rely on antiquated and discredited medical practices. In the 18th century, lawmakers and social reformers were forced to learn harsh lessons about trying to control women’s sexuality. Disgusted at the torture and execution of young women, reformers were forced to acknowledge that punishing pregnancy merely encouraged infanticide. When they lessened the social and legal pressures facing unwed mothers, they discovered that infanticide lessened dramatically. In the past few years, however, we have seen repeatedly that lawmakers are trying to roll back not just decades but centuries of progress. Over and over, these lawmakers seem to be adopting the latest in 17th-century thinking as a basis for policy. In theory, American women still retain the right to regulate their own bodies without fear of persecution. But Purvi Patel’s case, with its preconceived notions of guilt and its obsolescent methods, suggests the opposite. Images via Wikipedia and St. Joseph's County, Indiana, Police Dept. Margaret Lewis is an assistant professor of history at the University of Tennessee Martin. She specializes in early modern European history with a focus on women and gender issues. Her book, Infanticide and Abortion in Early Modern Germany will be published later this year.